Why do clients with TMJ pain often have associated neck pain? It’s because the TMJ is closely related to the neck both anatomically and functionally. Let’s explore this a little more. Neck Pain is a very usual consequence of TMJ pain - I rarely see a client with TMJ pain that is not associated with neck pain. This is because the TMJ is closely related to the neck both anatomically and functionally. Let me explain this to a little bit more. The your jawbone (mandible) is connected to the skull by the Temporomandibular Joint (TMJ). Just behind your jaw are the upper neck facet joints. So, when your neck moves so does your jaw - and when your jaw moves so does your neck! 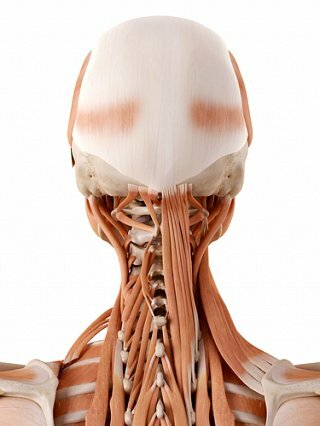 The muscles that move your jaw are attached via fascial tissue to each other, and to the muscles that move your neck. Therefore there will always be a movement relationship between your neck and jaw. Firstly, I would say don’t ignore signs and symptoms of jaw and neck disorders as they will rarely fully heal by themselves in the long term. As always a correct diagnosis is the most important aspect in the long term resolution of pain and in these cases even more so. The cause of your TMJ pain can be from the TM Joint itself or can be from a problem in your neck function which has knock-on effect to the jaw. I sometimes see people who have had dental work and appliances prescribed to treat their jaw when in fact the root of the problem is in their neck. In these situations the jaw pain returns after time as the cause of the pain is still there. That is - until we resolve the underlying issue in the beck. ... a correct diagnosis is the most important aspect in the long term resolution of your TMJ and neck pain. So, if you have TMJ and neck pain, then we may need to consider two scenarios. If your jaw is the primary problem then treatment to your jaw is the primary route of treatment, followed by treatment to your neck. If your neck is the primary problem, treatment to your neck is your first form of treatment followed by or in conjunction with treatment to your jaw. Treatment may involve mobilisation and TMJ exercises alone or it may require dental correction followed by mobilisation and exercises. The key is in the diagnosis and the elimination of the cause. Rarely is surgery is required, except where structural changes have occurred in your jaw from the problem being there for a long period of time or from a direct trauma to your neck or jaw. You can read more about TMJ Treatment options here. Let me tell you about Tara (not her real name!) who suffered with her neck and TMJ. Tara was a 14 year old girl who had left sided neck and jaw pain. She had been suffering with her pain intermittently for three years by the time she was referred by her GP (Doctor) to me. It all started when she was eleven and one day while eating, she felt pain in her left jaw. After a few days the pain disappeared but every time Tara ate something which required her to open her mouth wide her jaw would ache and on occasions make a “clunking” noise. It was never bad enough for her to go to the doctor and she adjusted her method of eating so as not to place any pressure on her jaw. By doing this she stayed generally pain free. Unfortunately, the underlying condition continued to exist. Then, one day her jaw pain became very severe following a laughing episode! She was prescribed some painkillers, which helped but the following day the left side of her neck was hurting also. She went to her doctor who referred her to me. On assessment, Tara had a compressed and tight left-sided TMJ. Also, when I palpated (examined) the facet joints in the upper part of her neck were tight and restricted. I treated Tara to ease this tightness on three occasions and her symptoms improved considerably. At the end of three sessions she reported her pain to have improved by about 70%. From my perspective her movement had also improved by 70% but I felt I would be unable to resolve it fully so I referred Tara to a dentist specialising in TMJ. The dentist took some x-rays and agreed with my findings. He took a mould of her mouth and provided her with a night splint to wear as she slept. In the meantime I continued to treat Tara’s jaw and neck. 8 weeks later Tara had a full range of movement and was pain free. She felt confident biting into apples again! We advised her to continue to wear her night splint and do her home exercises. The dentist and I reviewed her three months later. She was perfect! Her splint was no longer needed but we advised her to have an annual review to ensure the problem did not return. So far so good!